-US Dow Jones gained 30.46 points to 10437.42 in yesterday trading, Dow Jones gained for the 3rd day as rebound in metal prices boosted commodity producers share prices. Investors in the market are optimistic currently and believing the market still have more room to go higher. Goldman Sachs said it will be teaming up with Warren Buffet to provide assistance to 10000 small businesses in the US, which small businesses play an important role in creating jobs and growth of a country's economy. -Palm oil prices will likely be supported by weather concerns, as heavy rains and floods may disrupt harvesting activity in oil palm estates. -By Shie-Lynn Lim, Dow Jones Newswires. -Oil advanced for a third day in New York after an industry report showed a decline in crude stockpiles in the U.S., the largest energy consumer. Crude oil for December delivery rose 24 cents to settle at $79.14. 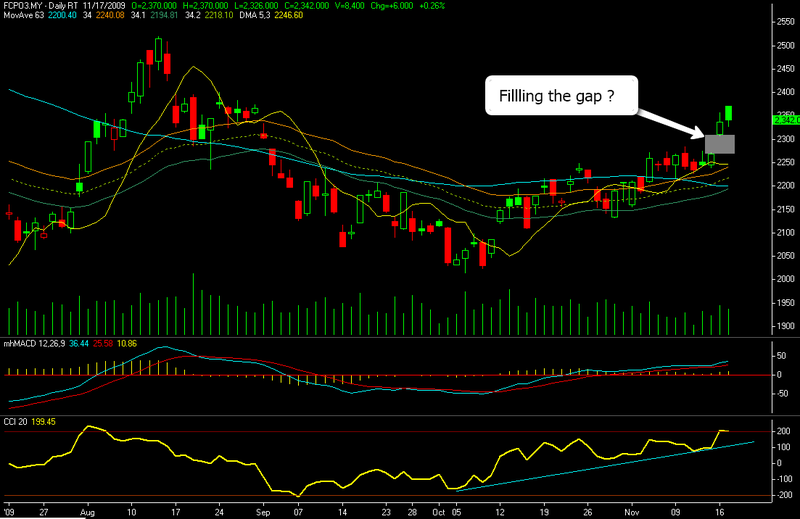 The term 'all gaps will be fill eventually' might not happen in this case. I am somewhat susceptible that this gap will be fill judging from the positive sentiment in the commodities market. If price does fall, maybe 50% of it would be fill. Now, technical analysis are not going to tell me for sure whether price is going to gap up or gap down, but in this case if the price do gap down not too much from yesterday close it might attempt to close the gap. Either way, I am still bullish on palm oil and this uptrend. None any trend will travel on straight line, it always comes with some 'nasty' retracement, correction, pullback, squeezing, hammering, shaking, etc before you can see a clear direction on that trend. If you are serious about trading, its your job to filter out all these 'noise' in the market. Good Luck comrade. Disclaimer: The author is not liable for any loss incur due to this write up and trade recommendations made by this websites.